Gated tropical resort, 2 bedr/2 bathr condo+terrace for 2-5p. +2 pools.Free GPS. 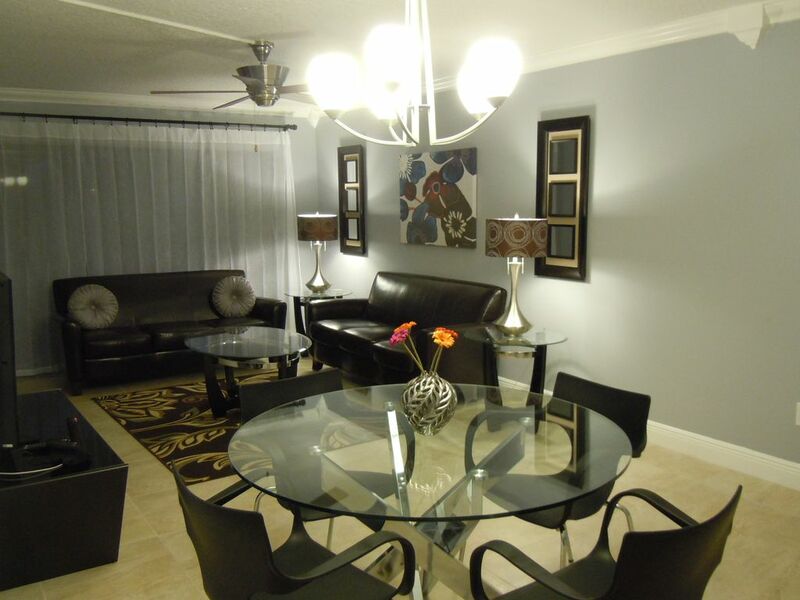 This completely renovated elegant modern vacation condo/apt. ( 88 sq m or 900 sq ft apartment with 2 bedrooms, 2 bathrooms + terrace + free Wi-Fi + free GPS + free parking + Welcome Drinks +Coupon Package is located at the tropical peaceful resort 'Ventura Country Club.' Enjoy a nice cocktail at one of the two refreshing pools or have a nice lunch at the Club House restaurant. There is also tennis and a golf course, an elegant clubhouse with restaurant and bar, jogging paths, fitness center, large lake, children's playground, basketball, 24-hour security and much more. No cleaning fee !!! Each reservation includes the free use of a GPS + a selection of a non alcoholic 'Welcome Drink' + Super Saver Coupon Package with lots of discounts + maps of Orlando and Florida+ brochures of the Orlando attractions + lots of tour books about Orlando. I also prepared a folder for my guests with recommendations of restaurants nearby as well as supermarkets, pharmacies, Aldi, Walmart, hospitals,dentists and doctors in case of Emergency. Since I live just 5 minutes from Ventura away I can be reached very quickly at anytime. This modern elegant vacation/ holiday condo/apartment has been completely renovated. It is decorated and furnished with high quality furniture reflecting a very modern elegant life style. The bathrooms are absolutely stunning and extremely luxurious with granite and beautiful ceramic tiles. Each bedroom (1 King + 2 Twins beds) + living room has a LCD flat screen TV, DVD, free Wi-Fi, free phone calls within the U.S, answering machine and much more. In addition, I offer a large selection of English tour books about Orlando and Florida for free. When renting my vacation condo, you can use a GPS for the length of your stay for free, no charge. The car rental companies charge about $ 8-10 per day for a GPS-NAVI. The GPS can be programmed in any language. All Orlando theme parks / attractions / restaurants / gas stations, etc. are already stored in the GPS under points of interest and can be easily selected. A GPS in the U.S. is very helpful if you are not familiar with the area. It is very easy to get lost. It saves a lot of $$$ and time!! Both bathrooms have been completely renovated. Everything was ripped out and is new. Very tastefully decorated with granite and gorgeous tile. Pure Luxury. My guests rave about the great bathrooms. Excellent property on the ground floor of a 2 story building. Walk to the golf course, clubhouse and pool. Condo has all you need and then some to allow you to move in and stay comfortably. It has 2B/R 2 Baths Lanai and 3 TVs . You are close to all theme parks and plenty of restaurants, grocery stores and shopping nearby. Great location for a enjoyable vacation and owner is very responsive to any questions or needs. When we arrived we found the condo clean and ready for us. The kitchen is well stocked for cooking. The guards at the front gate were friendly and helpful. We did have good communication with Jan.
We will be back and we will consider staying here again. This was the perfect place for my daughter and I to call home while we chased the roller coasters in Orlando. The condo is located about 30 minutes from both Disney World and Universal. When we arrived we found the condo clean and ready for us. We loved the many character stuffies throughout the unit. The kitchen is well stocked for cooking, including some basic spice and seasoning. We found the complex well maintained. The guards at the front gate were friendly and helpful - there was never any trouble coming and going. There was ample parking and the neighbors were quiet. We had no issues working with Jan. He provided a great instruction package that made it easy to find the condo and get settled in. We never got a chance to meet Jan in person, but he was only an email away if I had a question. If we are back in Orlando, we would consider staying here again if it was available. I traveled on business with my daughter who was on a fishing trip (Ladybass) in early May 2018. Communication with the owner is excellent. Jan (the owner) makes sure he addresses all the questions from before you book to after you leave. Best communication I had so far when renting a condo or a house. He takes pride in you being happy and satisfied with the stay. Great location just few minutes from the airport and right on the golf course. The whole area is well kept and landscaped. We found the condo spotless when we arrived. Place is extremely clean and very well equipped. You will find all the necessities required for the stay and all is working perfectly. Modern furniture in every room and up to date maintenance. I highly recommend this condo and will stay there again if I am in the area. Jan’s condo has everything. Truly! His reviews say it’s clean. That doesn’t even come close to how clean it is! He has every appliance and kitchen utensil you could hope for. Comfortable beds, sheets, tv/WiFi, veranda, living areas. It all sounds too good to be true, but it’s all true! We so enjoyed our time at the condo and Ventura CC. The restaurant was very good, as was the golf! The pool was amazing and clean. Very relaxing vacation. We would highly recommend renting his place. We will definitely be back. We can’t thank Jan enough! Hello Janet. I'm so glad you enjoyed your stay at my condo very much. All the best. Jan. Enjoy your vacation at Ventura Country Club, a tropical gated resort near the local attractions in Orlando. Enjoy a cocktail or a glass of wine at the nearby pool after a long day at Disney or shopping. You can also have a nice dinner at the Club House overlooking another large pool or play a round of golf. Ventura Country Club has lots of amenities to offer. This elegant modern 2 bedroom 2 bathroom vacation home/ condo is extremely clean, inexpensive, fully furnished and was just completely renovated. Free parking in front of the condo, free WIFI and the pool is just steps away. Each rental includes a free GPS rental, Welcome Drink ( a selection of non alcoholic beverages),Super Saver Coupon Package, free maps and brochures about the local Orlando attractions. within a 2 minute drive. Ventura Country Club also offers a very nice Clubhouse with a great restaurant and good reasonable priced food overlooking the large pool and golf course. There is also a bar, fitness center, library, tennis court, walking trails, a large lake, 24 hr security, playground, basketball, tennis court and much more. So many activities to choose from. This is a great place for a relaxing tropical vacation.